(Pig Exploitation - Gestation Crates - 05) This factory farming operation utilizes partially open gestation "stalls" in which the pigs are secured by their heads and necks so that they cannot even turn around. All they can do is stand up and lie down with their legs under them. The slotted floor allows urine and feces to be forced town to the sub-floor below. The fumes and odors are atrocious. 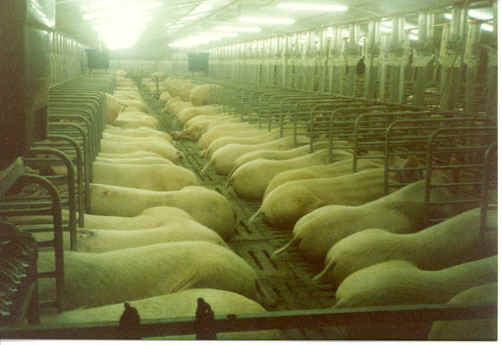 To understand how these pigs feel, imagine yourself living in these conditions. Then stop eating pork, ham, bacon, and other products made from pig body parts.